We spoke with Ruiz to learn more about the issues men face around HIV in Mexico. Diego is a health advocate who speaks openly about his experiences living with HIV. He works to combat stigma and discrimination through his social media platform. How would you describe the average experience for HIV-positive gay men in Mexico? I think it’s quite complicated. Unfortunately, there’s a lot of stigma around HIV in Mexico, and many people are prejudiced about it. But we also have very empowered and informed people who make a big difference. What made you decide to be so ‘out’ online about your HIV status? The need that I had after the diagnosis was having someone close to me who had already gone through what I was going through. Someone who also lived with HIV and could say, “I’m fine, look at me, and you’ll be fine too.” I decided to try to be that person and see what would happen. What sort of reactions have you received from the public around your HIV status and being so out about it? The reactions have been so mixed, so I wouldn’t know where to start. There were some people who at the moment of knowing my status stopped all contact with me and shut down. Some asked me if they can get infected just by touching me and if I’m going to die. Then there are others who took the issue from a more sensitive and human side, understanding my need to say that I live with HIV out loud. What’s the best way to deal with people online who try to stigmatize HIV-positive people? I’ve always thought that our most powerful weapon against stigma and prejudice is first-hand information. I share my experience without taboos and by always being very honest. We must take the issue everywhere, even with our family and friends at any time. What is the best thing to tell gay men who have just found out they are HIV-positive? Things improve. At this moment you will surely feel confused, lost or with many questions, but over time you will solve your doubts and things will inevitably improve. This can be the beginning of a great journey in which you can improve in so many ways. Being “undetectable” is still a relatively unfamiliar concept. What can be done to ensure more gay men understand that undetectable means you can live a long and healthy life, and that if undetectable, transmission cannot occur? I believe that each person can put their two cents into this topic by talking more and more to eliminate stigma and by providing reliable information. 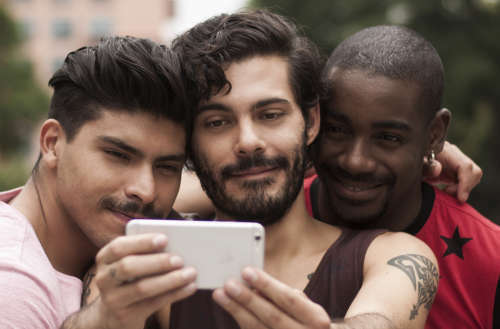 How can we get more men to talk about HIV on social networking apps like Hornet? We need to provide more openness, love and consideration for the people of our community. I firmly reject the discrimination amongst ourselves in the LGBTQ community. People living with HIV become victims of these type of discriminatory acts. We must begin to unite as a community to achieve real improvement, where we can accept each other, no matter where we come from, who we are, where we are going. … We need to accept ourselves.